Natalie Keepers faces a bail hearing Wednesday, a day after prosecutors added a more serious charge of being an accessory "before the fact'' to first-degree murder. Her classmate, David Eisenhauer, is jailed on charges of kidnapping and murder. 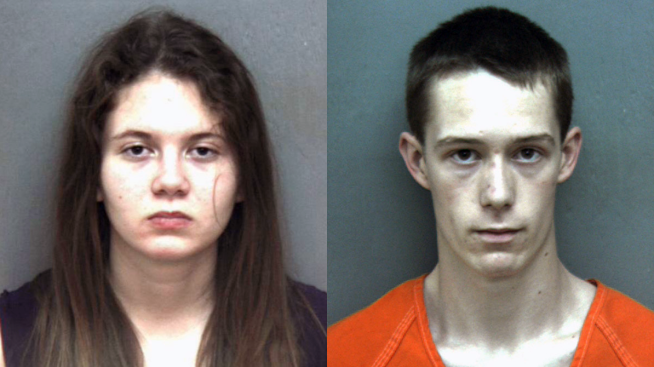 A Virginia Tech student who was initially accused of helping dispose of 13-year-old Nicole Lovell's body is now believed by authorities to have played a bigger role in the girl's stabbing death. Just exactly what Natalie Keepers is accused of doing still hasn't been explained. She faces a bail hearing Wednesday, a day after prosecutors added a more serious charge of being an accessory "before the fact'' to first-degree murder. Her classmate, David Eisenhauer, is jailed on charges of kidnapping and murder. Both Eisenhauer and Keepers graduated from nearby high schools in Maryland. A neighbor said the seventh-grader told friends she would sneak out to meet her "boyfriend'' David, an 18-year-old she met online through the Kik messaging app. Nicole's mother discovered her missing last Wednesday morning, setting off an intense hunt for the girl, who suffered bullying at school and online over her weight and a tracheotomy scar, and needed daily medication after surviving a liver transplant, lymphoma and a drug-resistant bacterial infection as a 5-year-old. Police quickly zeroed in on Eisenhauer, and then found Nicole's body Saturday, hidden off a North Carolina road, two hours south of campus. Eisenhauer told police he believed the "truth will set me free'' after he was arrested Saturday, but a police document did not elaborate on what he meant by the statement. Stacy Snider, a neighbor whose 8-year-old twins played with Nicole, told The Associated Press that before she vanished, Nicole showed her girls Eisenhauer's picture along with a thread of texts they had shared and said she would be sneaking out to meet him. Snider said she learned all this from her girls only after Nicole vanished. "I would have told her mother. But we didn't know nothing about it until she came up missing, unfortunately,'' she said. Her fate devastated her mother, Tammy Weeks, who spoke at a Tuesday news conference, describing the health problems her daughter battled and the joys in her short life. "Her favorite color was blue. Nicole was a very lovable person. Nicole touched many people throughout her short life,'' Weeks read from a statement before her sobs became uncontrollable and she was ushered away. Blacksburg police said they have evidence showing Eisenhauer knew the girl before she disappeared Wednesday but provided no more details. Kik Interactive, based in Ontario, Canada, was "active in helping the FBI carry out their investigation,'' spokesman Rod McLeod said. Kik, along with Instagram and Snapchat, are particularly popular with younger teens, and it's impossible to keep underage users from signing up. Even kids whose parents closely monitor their activity on sites such as Facebook often use smartphones with other social media where predators lurk, said Adam Lee, special agent in charge of the FBI in Richmond. David Finkelhor, director of the Crimes Against Children Research Center at the University of New Hampshire, agreed that parental oversight is a good thing but cautioned against placing too much blame on technology.